The man, whose first name comprises the film’s title (because, in a simple but profound way, this is, indeed, a film about this man), is under the heaviest strain. His wife has died. 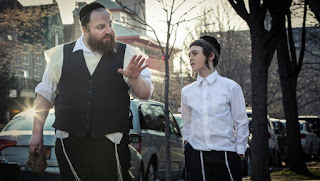 Under the rule of law in the Hasidic Jewish faith, his son cannot stay with a single parent, and so the boy must reside with the man’s sister and brother-in-law. Menashe is unencumbered by the constraints of a plot, though its machinations play out like one in any case. It is about this man and his situation. At only 75 minutes (minus the credits), co-writer/director Joshua Z Weinstein’s narrative feature is compact, occasionally to a fault. It is also anchored by its lead performance. Menashe Lustig might as well be playing a version of himself here, although the lack of knowledge about the man’s life is a major hurdle to knowing such a thing. Whatever the case, the actor is exceptional in the role of a man suffering hard times after an unthinkable loss. His son, Rieven (Ruben Niborski), doesn’t particularly seem to want to stay with his father, and so he stays with Eizik (Yoel Weisshaus), the brother-in-law to Menashe, who is devoted to tradition. A rabbi (played by Meter Schwartz) presents a compromise as the memorial to Menashe’s late wife draws near. Rieven will stay with Menashe for the month leading up to the memorial, after which he will be returned into Eizik’s custody. The month simply adds strain onto Menashe’s shoulders, not least when an inattentive mistake costs his place of work a thousand dollars in loss of fish. Menashe’s job is constantly on the line here, as it seems the man is imprecise in his approach to an occupation for which he has no passion or motivation. He oversleeps, causing a lot of grief for his boss, his son, and his brother-in-law. He rejects the women arranged for him by a matchmaker. Perhaps the reason for that last one is a lack of readiness. It’s only been six months since his wife’s death, and even with the wellbeing of his son as a factor, he can’t face the idea of another marriage. Furthermore, his brother-in-law mocks and scorns him for the tiniest hiccups, blowing each of them up to be much bigger than they are and to be, in some way, a commentary on his character and resolve as a man. In short, Menashe is an exhausted man and a pathetic figure in the lives of those around him, none of whom really extends the courtesy of good faith. This is a modest film of grounded drama given a quiet treatment that never quite – it is true – takes off into the arena of being genuinely moving beyond Lustig’s portrayal of the man’s circumstances. Weinstein keeps in the shadows as a director, simply observing the actions and reactions of this man and his family, and his screenplay (co-written by Alex Lipschultz and Musa Syeed) is observant in its own way. There is the feeling of improvisation at the edges of the exchanges here, where the dialogue is unforced and natural, but not in the trajectory, which begins at a specific point in this story and ends at a decisive moment, too. Menashe meets in the middle of those two states of being, and it’s surprisingly effective.